This chat was recorded by Quilty Bookmite. The comments are his. I arrived early to give everything a chance to rez. For some reason it's raining but only in the PaB pavilion. I went to wash the dishes in real life. When I came back Avastu was sitting next to me. Quilty Bookmite: Hi Avastu. Sorry, I was away washing the dishes. Quilty Bookmite: How are you? Avastu Maruti: well, and you? Quilty Bookmite: As well as can be expected. Quilty Bookmite: Anyone any idea why we seem to have this rather localised weather system? Wol Euler: hello Quilty, Avastu. Wol Euler: ah, the rain. Wol Euler: hmm, Gaya has a rainmaker, perhaps she set it on and forgot it? Wol Euler: you#re looking very formal today, Quilty. I'm dressed in formal Victorian garb with a stovepipe hat. Quilty Bookmite: Steampunk. :) I've been up to New Babbage. Quilty Bookmite: Again it makes a nice change from my usual jeans and t-shirt. Wol Euler admires. Lookin' good. in a private conversation Wol lets me know that my shoes are a little small for my feet and that my feet are sticking out the sides. Not a good look. Later on I stretch the shoes a little to fit. Quilty Bookmite: The hat took some adjusting. Probably still needs a bit. Quilty Bookmite: I'm a bit of a fan of I K Brunel. My hero, Isembard Kingdom Brunel, one of the great engineers of the Victorian era, had a liking for stovepipe hats. Wol Euler: steam and all, y'know. Quilty Bookmite: I'm actually more a fan of Victorian engineering than steampunk. Wol Euler: Storm and Gaya have rainmakers, one of htem probably left it runninng here. Quilty Bookmite: Hasn't rezzed for me yet. Tahuti Thor: so u walk anywhere in zen area and its raining? Pia Iger: wow, raining hard outside. Wol Euler: I think it's localized, 20 metres or so IIRC. Quilty Bookmite: If you're not there is it really raining? Wol Euler: yes, it stops at the bridge. Pia Iger: and raining through the roof, too. Cool! Quilty Bookmite: Does anyone have a particular subject for today? Quilty Bookmite: Nearly said "tonight" but of course it isn;t for everyone. Tahuti had disappeared and reappeared. Probably a crash. Wol Euler is more in a sitting-and-listening mode today. Pia Iger feel peaceful, too. Quilty Bookmite: Must be the rain. Wol Euler: I like a change from the perpetual sunshine of SL. Quilty Bookmite: Can I ask a technical SL question? Wol Euler: If I had a sim I'd make it rain buckets every day, like in Rashomon. Quilty Bookmite: How do you express a feeling in chat rather than just talking, such as "Wol Euler smiles"? Wol Euler: just start the line with "/me"
Quilty Bookmite gets it now. Wol Euler: like "/me nods"
Pia Iger: simple trick, very expressive tool. Avastu seems to have a strong desire to commit arson on my hat and tries several times. I take the hat off for now to remove temptation. Underneath I am completely bald because for some reason I can't wear this hat and my hair at the same time. Quilty Bookmite: Now I need to put my hair on. In front of me is a small fire. Quilty Bookmite: Where did the fire come from? Tahuti has what seems to be a serious question. Makes a change from my ramblings. Tahuti Thor: anyone came to conclusion that our thoughts and feelings are unreal or maybe more appropriate to say unsubstantial ? I put my hat next to the fire. Quilty Bookmite: Was this a previous chat? I don;t think I was at that one. Pia Iger: Tahuti, I discovered that unrealness recently, too. Pia Iger: but I can't say all thoughts and feels are unsubstantial. Wol Euler smiles a welcome to Gaya. Quilty Bookmite: Insubstantial sounds quite obvious. They have no form so of course they are insubstantial. I'm probably being a bit pedantic here about the word "insubstantial" which means having no substance, in other words no physical form. I'm curious to know what is really meant here. Wol Euler: Are they less substantial than my perception of "reality" is? Wol Euler: I percieve both. I try and get a definition. Quilty Bookmite: What is the difference between having no form and being insubstantial? Quilty Bookmite: Thoughts are just a series of neurons firing in the brain. From that perspective they aren't real. And Tahuti comes up with a completely different question. Tahuti Thor: my real question is from here.........what to say about politics? Wol Euler: my reading your words is neurons firing in my brain. Tahuti Thor: can and do spirituality and politics mix ? Pia Iger: or 'Insubstantial" in the sense they are not grounded in reality. Quilty Bookmite: I'm not sure what that means. So I wonder if Tahuti is trying to divert us from his original question. Quilty Bookmite: Tahuti, you would rather change the subject? Pia Iger: politics is included in the whole picutre, IMO. Quilty Bookmite: Politics can't be dismissed lightly. It impacts peoples lives in very real ways. Tahuti Thor: people have religious views, political views, etc....how serious to take our own views? Isen Enzo: politics is hard. Isen Enzo: Quilty Bookmite said it! Isen Enzo: I am a has-been small town politician! Tahuti Thor: are all spiritual people humanists ? Wol Euler doubts that _all_ of any category ever belong to any other category. Isen Enzo: I think it really involves everything in the entire web of life.. I have been running up my browser to look up Wikipedias definition of Humanism. It takes a while with SL eating most of the memory but Isen seems impressed anyway. Quilty Bookmite: Wikipedia: Humanism is a broad category of ethical philosophies that affirm the dignity and worth of all people, based on the ability to determine right and wrong by appeal to universal human qualities â€” particularly rationality. Quilty Bookmite: I'm not sure all spiritual people would believe that. Quilty Bookmite: I don't think it fits with "original sin". Gaya Ethaniel: huh what's omb Isen? Quilty Bookmite: Oh my bod? Isen Enzo: I like that..
Pia Iger: Isn't it hard to speak for 'all spiritual people'? It would be more sense to speak on our own personal level. Isen Enzo: Heavy definitions here..
Isen Enzo: reaching my load limit..
Wol Euler: aha! I thought it might be yours. Gaya has a fish swimming round her enjoying the rain. Quilty Bookmite: Actually I like the rain. Nice change from all this sunshine. Solobill Laville: Or is that more of a paraphrase? Isen Enzo: It's really hard to mix..
Pia Iger: what do you mean mix? I don't think they are totally separated. Quilty Bookmite: What about the monks in Burma? They certainly seem to get involved in politics. Tahuti Thor: u can politic but dont get attached? Quilty Bookmite: But it seems to me that what they are doing is getting involved in human life. Isen Enzo: lots of false friends and real enemies in politics..
Gaya Ethaniel thoughts monks are humans? Wol Euler: a nice phrase, isen. Quilty Bookmite: I mean that sometimes politics gets so intense that it needs intervention. Isen Enzo: lots of base interests in politics..
Isen Enzo: not enough higher interests..
Isen Enzo: money and power? Quilty Bookmite: I have a new manager at work. One of the first things he said to the group was that he doesn't do politics. Quilty Bookmite: Meaning office politics of course. Isen Enzo: where's our referenceairian? Quilty Bookmite: Politics is the process by which groups of people make decisions. Quilty Bookmite: "The term is generally applied to behavior within civil governments, but politics has been observed in all human group interactions, including corporate, academic, and religious institutions." Isen Enzo: this is great..
Quilty Bookmite: I think the power comment was more of a comment on the nature of politics than a definition. Quilty Bookmite: Sorry Isen, you said it. I could be misinterpreting. Isen Enzo: yes, but money and power are a strong component of government politics..
Isen Enzo: as we are social..
Quilty Bookmite: It's part of normal human social interaction. Isen Enzo: it follows that we try to organize..
Isen Enzo: some try to organize for harmony, others for gain..
Quilty Bookmite: And those that organise for base gain tend to float to the top? Quilty Bookmite: We have a few "honest" politicians in this country but I have to say they seem to be a dying breed. Isen Enzo: It's a group thingie..
Isen Enzo: and how it is organized..
Quilty Bookmite: Don't understand "crips" and "bloods". Isen Enzo: the group organization thang is the problem..
Isen Enzo: so many try to game a system..
Isen Enzo: be true to their school..
Isen Enzo: show the colors. Quilty Bookmite: It seems that if you want to rise to the top you need to keep a lot of people happy. That means letting go of any principals you may have. Isen Enzo: and gangs discourage outside activity/action/thoughts.. 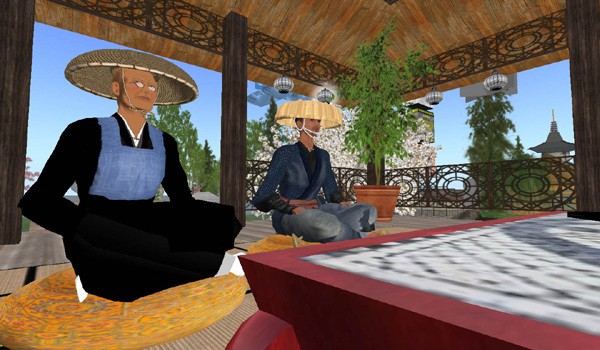 I glance across and two participants are wearing oriental style wide hats. Very effective for keeping the rain off. I put my stovepipe hat back on. Again Avastu wants to set fire to my hat. Avastu Maruti gave Quilty Bookmite Flame. Pia Iger: so what is motive behind the gang/group, or power play? Pia Iger: isn't it fear sort of? Wol Euler: yes, the leaders have a very differnt motivation to the "grunts". Quilty Bookmite: Most people don't want the burden of making decisions for themselves. Quilty Bookmite: Maybe they don't trust themselves. Tahuti Thor: peer pressure, family has gang history, etc. Quilty Bookmite: Also, they want to fit in and not be an outsider. Avastu departs and soon so do most of us. Solobill Laville: Yes, bye all! Pia Iger will join next time. bye for now. Wol Euler: bye solo, take care. Quilty Bookmite: I suppose I should call it a night. Quilty Bookmite: I need to go and dry out.